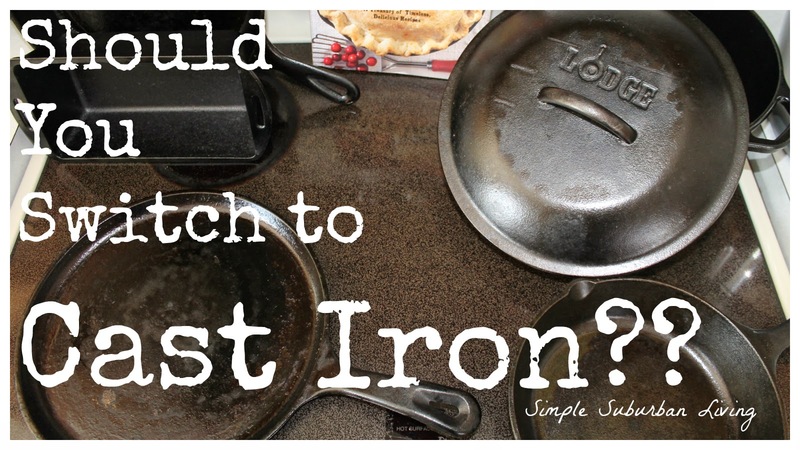 Isn't cast iron hard to clean? Won't it rust? Doesn't everything stick to the pans when you cook? Why should I spend more money on cast iron when I can get these awesome non-stick pans for so cheap? These are some of the questions that rolled around in my head when I first started thinking about cast iron. I hope to shed some light on these questions as well as share my experience with the Lodge brand of cast iron in this discussion. We started researching cast iron months before the plastic purge and had some ideas of what we needed in mind. After some careful reviews and research we decided to go with a package to start from a company called Lodge. This set came with one griddle, two different sized frying pans, and a Dutch oven. I also ordered a separate bread loaf pan later on. These five items have suited our needs thus far as we start on our non-stick free, plastic free, and kitchen junkware free life. The pans we have came pre-seasoned (process of allowing the iron to soak in oils) from the factory so not much was needed to get started. They are beautiful deep black and just looking at them makes you want to fry up some bacon and eggs for a farm style breakfast. The Dutch oven is perfect for soup, stew, broth, whole chickens, or breads and will also serve as a great camping items as well. The griddle is excellent for making homemade tortillas, frying eggs, pancakes, etc. The two sized frying pans are our go to for most of our cooking from eggs, bacon, ground beef, whole meals, and anything else you can fit in a frying pan. The surface is not perfectly non-stick like the cheap Teflon coated pans however it is not hard to cook on at all and with the aid of a real stainless steel spatula you will have no trouble cooking with ease. The longer and better you season the iron the better the finish becomes. They will not rust if properly cared for and even if you let them sit out in the rain you can clean them up with steel wool and re-season them back to new. These pans are indestructible, run them over, leave them out, drop them, scrap them, burn them, bash them, and do whatever you want and they will not break. These are the things that will last a lifetime and provide years and years of cooking for you, your children, and probably your grandchildren. So why buy plastic, Teflon, and non-stick garbage?